Community Windpower Ltd are delighted to announce that a planning application for an additional six turbines at our Sanquhar Community Wind Farm with an installed capacity of typically 19.8 Megawatts (MW), has been submitted to and validated by Dumfries and Galloway Council. An initial significant investment of around £30 million would be required to facilitate the wind farm construction. The provision of permanent jobs, contracts with local contractors and sub-contractors during the construction phase, will deliver a significant and positive financial boost to the area. This investment will be further enhanced by annual expenditure via rates, rents and service contracts of £1.2 million annually, equating to £30 million spent locally over the 25 year planning permission period of the wind farm. The financial rewards and benefits of the development will positively impact the local communities both directly and indirectly, which will help to establish the wind farm as an asset amongst local residents. In conjunction with the proposed wind farm, Community Windpower Ltd are committed to providing annual funding of £5,000 per Megawatt (MW) of installed capacity to the local community for the lifetime of the wind farm, in line with the ‘Scottish Government Good Practice Principles for Community Benefits from Onshore Renewable Energy Developments’ (April 2014). This would equate to at least £99,000 per annum, totalling £2.4 million over the 25 year operational period. £900 donation to the Kirkconnel and Kelloholm Children’s 2015 Gala to cover the cost of ‘Drums N Roses’ to play at the event. CWL are also working closely with Sanquhar Academy to support and fund their Skills for Work: Energy National 5 Course with educational classroom presentations on renewable energy and climate change. In terms of quantifying magnitude RenewableUK’s Onshore Wind: Economic Impacts in 2014 report found that a typical UK wind farm will invest £2.97m per MW (over its development, construction and O&M stages). Of this, 69% (£2.06m per MW) of this total spend is retained within the UK economy. This is confirmed with the overall investment of Sanquhar ‘Six’ being £60 million, with some £40 million being retained within Scotland. During the construction phase, the proposed Sanquhar ‘Six’ Community Wind Farm would support over 100 jobs, both in the construction and supply industry. The scheme would also provide two new highly skilled permanent jobs in the area, in the form of turbine engineers to maintain and manage the wind farm through its operational life. Local suppliers and contractors will be able to tender for contracts in the coming months. CWL is committed to creating long-standing relationships with Scottish companies to deliver our wind farms and have a strong focus on Scotland. CWL operate a ‘Buy Scottish’ programme which places a strong emphasis on employment in Scotland. This involves active engagement with Scottish civil, electrical and engineering contractors to construct our wind farms. This has recently been reinforced with the signing of a Memorandum of Understanding with Wind Towers (Scotland) Ltd, agreeing that the steel wind turbine towers for our projects are supplied from their steel tower fabrication plant in Campbeltown. This plant provided the towers for our first scheme in North Ayrshire at Dalry and is supplying the towers for the forthcoming Millour Hill Extension project and are due for delivery in September. CWL is proud to have worked with Scottish companies on the development and construction of our four operational wind farms and is committed to continuing this by using Scottish companies to deliver the Sanquhar ‘Six’ Community Wind Farm. 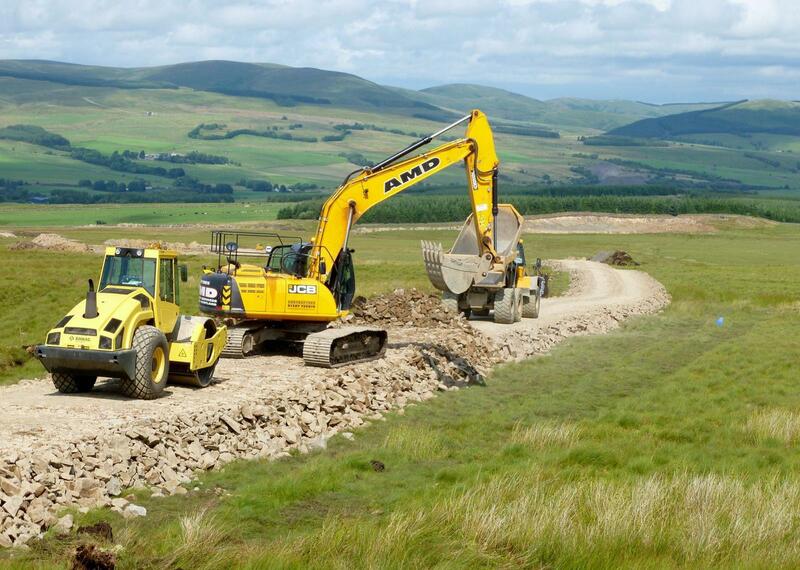 Our consented Sanquhar Community Wind Farm is another prime example of our commitment to Scottish companies as local contractors AMD were awarded the main civils contract as a result of our ‘Meet the Buyer’ events in the region. Other local fencing companies have also been utilised on site along with RJ Blasting. As a direct result of the work involved on the construction of the wind farm, AMD Contract Services Limited have been able to employ 6 extra staff and 2 additional CITB apprentices, all from the local area. AMD Contract Services Limited’s total head count of employees now stands at 60, with a hope to increase this to 65 by the end of 2015. Sanquhar ‘Six’ Community Wind Farm is located in an upland area with excellent winds and will operate at a capacity factor in excess of 30%. The wind farm is therefore expected to generate over 52,000Megawatt hours (MWh) per annum, which would be enough electricity to power around 12,400homes. The wind farm would also displace around 22,374 tonnes of carbon dioxide (CO2) per year which is the equivalent of over 559,000 tonnes of CO2 over the 25 year operational life of the wind farm. CWL’s consented Sanquhar Community Wind Farm and proposed Sanquhar ‘Six’ and Spango Community Wind Farms would bring around £500,000 in local Community Benefits annually to the host communities if all are consented and constructed. The Sanquhar ‘Six’ Community Wind Farm planning application (ref: 15/P/3/0166) and all associated documents can be viewed on Dumfries and Galloway Council’s online planning website with hard copies available for viewing at Sanquhar library and Kirkconnel library. If you would like to register your support for this planning application, please email pe.nithsdale.planning@dumgal.gov.uk quoting the planning application number and stating your reasons for supporting the application. The planning application is due to be considered and determined by Dumfries and Galloway Council by August 2015.